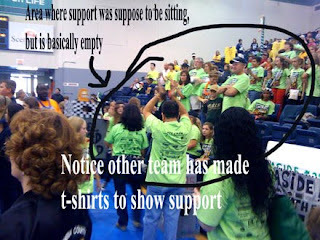 Tales From The Trenches of Parenting: Congrats to Gulf Breeze Middle School Robotics Team - But Where Was The Support From The School?? 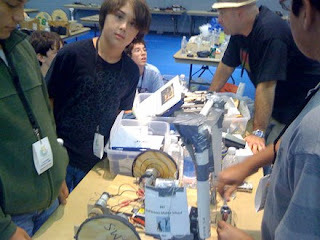 Congrats to Gulf Breeze Middle School Robotics Team - But Where Was The Support From The School?? I want to start out by congratulating my son, his nine other teammates, and their teacher Mr. Fearon, for advancing to the semi-finals of the Robotics Competition here in Pensacola, FL. I am immensely happy and proud of my son and all his teammates for this. They were never expected to get this far. "Big Deal! ", you may say, but the point is, since budget cuts in our middle school forced it to end the Science Olympiad program, the Robotics Program replaced it and this the first time/first year that this middle school has ever competed. The kids are given a rag tag group of parts which include pieces of PVC pipe, some wood, and some electronics to put together to make the "brain" of the robot, and to make the servo(s) to move the robot around via a radio control console. It is designed to pick objects up, move objects around, and gather objects into their area and are judged based on effectiveness of supplies used and ability to gather these objects effortlessly. If you had seen them last week, you would have thought they didn't have a chance. But what a week makes in the areas of revamping and redesign, and some major determination by a group of boys. They knocked it out of the ballpark by being one of the four teams chosen to advance to the semi-finals out of 21 other schools competing today. Telling them "good job", just doesn't cut here. They were the underdogs of the underdogs and those boys proved themselves WITHOUT the support of anyone but themselves. "Huh? What does that mean? ", one of might be asking if you are still reading this because it contains plain old boring science that most people don't care about unless your fighting for your survival after just moving your whole family here from a third world country, or you're one of those who already been labeled a "geek" by your peers of whatever age. 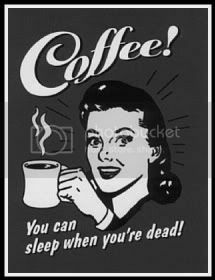 "Please be sure to **yawn** join the Robotics Team **yawn** on Saturday for the Robotics Competions at UWF **yawn, yawn**. It starts at 8:30 in the morning." And I am sure the announcement was met with a lot of comments like, "BOR-ing", and "I'm gonna be sleeping at that time", or "I've got a football game instead." I was unable to attend because I got hit in the middle of the night with one of my bad-timing migraines. I licked the headache, but the meds had been dragging my head around the house in a cardboard box, so driving was completely out of the question for me. So the hubs "volunteered" himself, which really wasn't volunteering he did, but rather him being under the gun from my threats that he was sleeping in his car for the next week if he didn't take our son and show roaring support for all the time, energy, and enthusiasm he had put into this thing. There should have been a few more out there like me when it came to generating ANY support from Gulf Breeze Middle School. 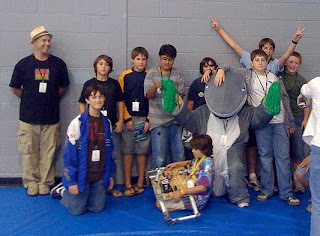 See, no one from the school except some kid dressed in a tacky dolphin costume showed up to support these kids who ranged from 6th to 8th grade. As my son and hubs told me, there were bleachers set up for those who came out to support their school. Gulf Breeze Middle School's bleachers were completely EMPTY while the other 21 schools came complete with mascots, cheerleaders, band members, and PLENTY of parental and other adult support to fill their bleachers. 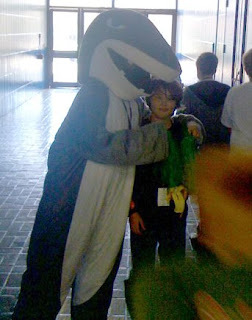 the kid in the tacky dolphin costume. OH, and the OTHER'S schools support supplied THEIR team with plenty of water and snacks to fortified their little brain cells pumping out as much mental energy as possible for a competition that lasted from 8 in the morning to 5 p.m. Other teams support were even handing out "souvenirs" in support of their teams in the forms of small banners, buttons, pens, balloons filled with sand, etc. Our team had nothing.... nada... not jack s***! Just a few boys, their parts, and their own handmade spirit... plus a few parents who DIDN'T get sidelined by a stupid migraine. These schools had cheerleaders and rows of tubas playing Ozzie Osbourne tunes and "We Will Rock You", as my son as his team stood and watched their rows of empty bleachers, and a half-witted mother of one of them run around freaking out how her printer blew up and "burned" the logo that my son spent three days designing for the t-shirts that never were made. Did I mention that the other schools had professional t-shirts or uniforms made for their competition? No, well I just thought I might mention that in case the PRINCIPAL of our middle school wanted to know. But the moral of this whole story is exactly what I told my son this evening after he told me one of the other teams offered him a Dum-Dum after seeing they nothing in the form of snacks to eat, at around 1:00; in which my son just happened to cut his tongue after licking it, which signal to him a bad omen so he threw it away. I told him that succeeding doesn't always include people in your corner cheering you on and laying offerings and gifts at your feet as you proceed. Sometimes it is through adversity and hardwork that you only succeed. No one might have been there for you, but all of you were there for each other and not one of you gave up on the possibilty of winning. Stuff like that isn't given to you; you either have or you don't, and in this case all of them had it and not one of them let it go. That is not easy to do when you're the only one without a fan club cheering you on. It seemed like the middle school just didn't have an "interest" in what these kids were doing; that it was just another filler program for "some" kids to get involved in - nothing more. But there is something more; the fact that these kids turned a first year program into something for themselves. But I guarantee you that the school will turn around and make into something that the school did in order to look good for their community here. I want to make it clear that there was little to no support for these kids from their own school, it's administration, it's own PTA, and it's peers. What they did was a direct result of the heart and soul that each child put into that robot, and one amazing teacher in Mr. Casey Fearon who fostered each of their imaginations and assisted their drive to do their best. I am prouder of my son and these kids because with everything going against them; inexperience, intimidation, lack of support, etc., they still rose to the occasion and believed in what they did and in one another. I for one am having my son remake his logo and I will be making and purchasing the shirts out of my own pocket money. If any other GBMS administrator, parent, or PTA member is reading this, I suggest you ask Mr. Fearon how you may contribute as well. It may not be a stinking Dolphins football game under the bright lights of a stadium every Friday night, but these boys are our future and deserve just as much money, time, support, and respect as the shining linebacker or quarterback of that said football team. So how about it Mr. Richard Cobb, Principal of Gulf Breeze Middle School? Do you think you could spare a little time, a few cheerleaders, a couple of band members, and maybe make one of those special mass phone calls to each parent and generate a little more support for these kids when they hit the semi-finals in two weeks? Feel free to email this guy or his administration to help generate some support for these kids, and you don't have to be just a "geek" to do so. I'll be contacting our local newspaper to generate a little support of my own come Monday morning. Go Dolphins! - Robot Style!! BRAVO JULIAN!!!! BRAVO TO THE WHOLE TEAM!!! You guys absolutely rock! Semi-finals...look out, here come the winners! I always motivated by you, your views and attitude, again, thanks for this nice post.